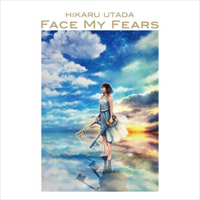 Single cover for "Face My Fears"
"Face My Fears" is the opening theme song of Kingdom Hearts III. It is sung by Utada Hikaru and co-written by Utada, Skrillex, and Poo Bear. The song is written as having the same chords as Kingdom Hearts's "Dearly Beloved". It is also written in the same key as "Passion", as noted by Skrillex. ↑ @Skrillex - "Also I wrote that chords for face my fears in the same key as Passion as well"
This page was last edited on 1 February 2019, at 17:42.